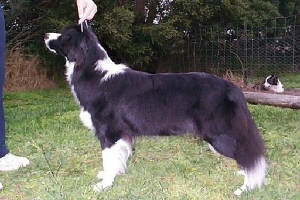 Kira is on loan to us from Samantha Douglass and Michael Goulding from Etherial Border Collies. We got Kira to campaign as our second breed in the conformation ring. By 8mths of age and with limited showing Kira was more than half way to her title and has picked up numerous class in groups and sweepstake wins and a Runner Up Best In Group . She has since had time in the whelping box, whelping a lovely litter for Etherial Border Collies and Kira's progeny are doing well in the conformation ring.